TALA 21: Bog Orchids... not yet found in L. Allen! 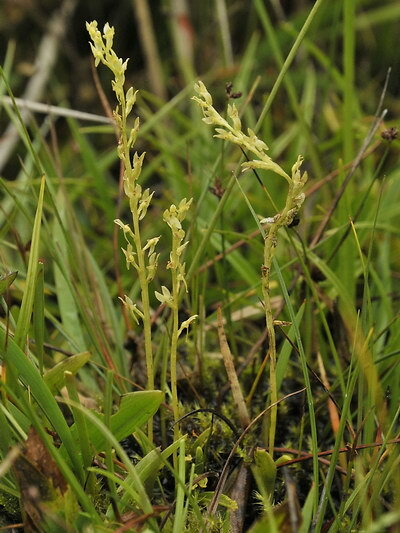 The Bog Orchid is probably Ireland’s must invisible Orchid. 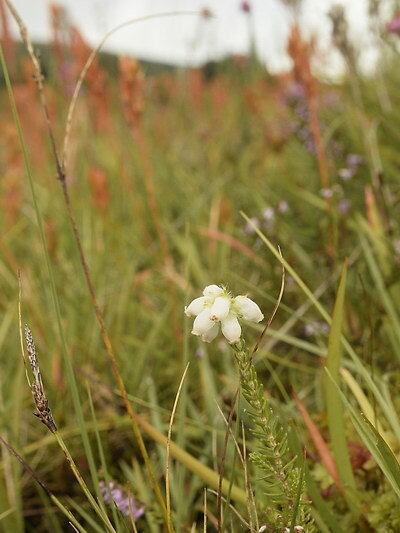 Yes, it may be more common and widespread than the Irish Lady’s Tresses but it is so small and elusive and specialised in regard to habitat, that it is very difficult to survey. The habitat at Lough Allen, in many ways, looks suitable for this species and we would dearly love to add it to our list of Biodiversity. But, so far, it has not be found here. This article outlines the characteristics of the species and the particular habitat needs it has — using experience of the plant from Co. Dublin — and reviews efforts made by many people to find it in Leitrim. Hopefully some of the pictures and habitat descriptions might just bring this plant to the attention of hill walkers and other explorers! NB. ALL THESE PHOTOGRAPHS ARE FROM DUBLIN, not Lough Allen, as they have not been found here yet! This is a guide to people walking the hills in case they are fortunate enough to across this rare plant. We would very much like to record these from the Lough Allen area. They appear as individuals but with others nearby. A unique set of conditions are required. Very slim olive yellow both flowers and leaves. Near or in flowing water. Appearing sturdy though still under 100 mm in height this plant is vigourous with many flowers packed closely together. Somewhat smaller, this plant has its flowers well spaced and easily countable. It is not as strong as the specimen on the Left. We wonder could this difference reflect on the age of the plant with the smaller specimen and smaller flowers occurring on a 1st year plant whereas the other could be older? We have observed this pattern in S. romanzoffiana around Lough Allen. 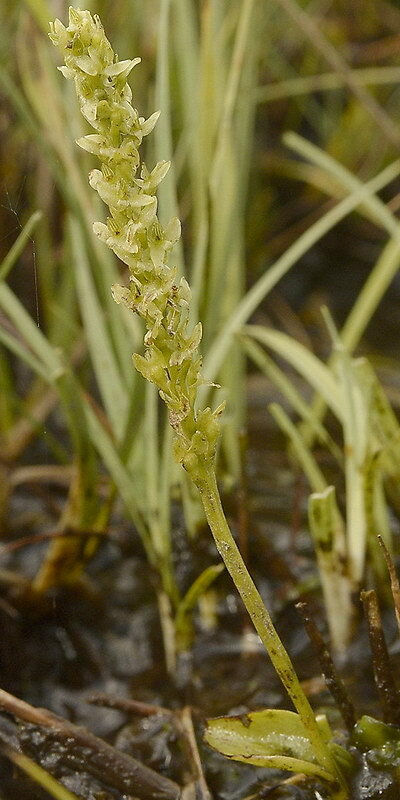 Bog Orchids are always found close to flowing water but where the slope may flatten and allow that water to slow down. It seems as if the water disperses this species. In this Dublin site most specimens occurred in mud or thin vegetation at the side of little rivulets. Other people report it occurring in Sphagnum areas also, where water draining off a mountain has been slowed down or ponded. It likes acidic conditions, hence its association with Sphagnum, and such good conditions do occur on the west side of Slieve an Iarann! 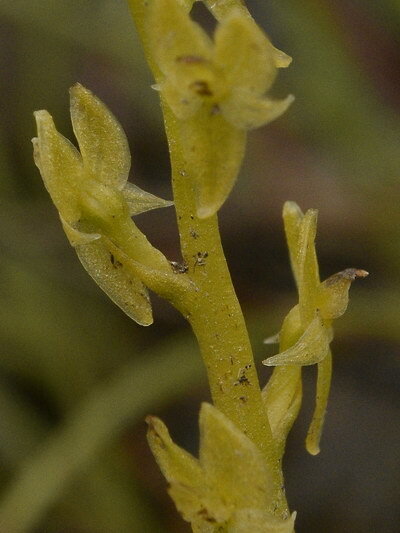 These two pictures show the flowering parts of the Bog Orchid in more detail, with matching pictures from a mature and a young plant. 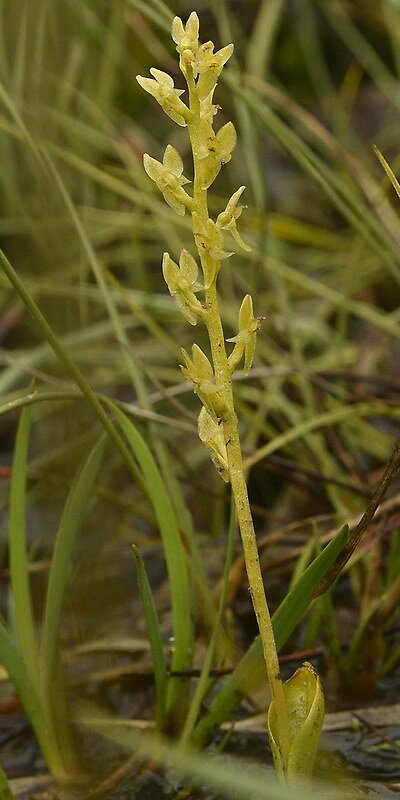 The detail shown in these images is hard to see in the field and, if the Orchid is growing on mud or clear ground, its thin bright yellow spike is the feature that is most likely to draw attention. All parts of the plant are either a greenish yellow or else a yellowish green colour with the basal leaves normally being the greenest part. The colour is quite distinctive but not so obvious when growing in Sphagnum as it very much matches the colour of the moss. LEFT: It’s hard to get perfect pictures of this species. This is the best image we have of a flower from the front. 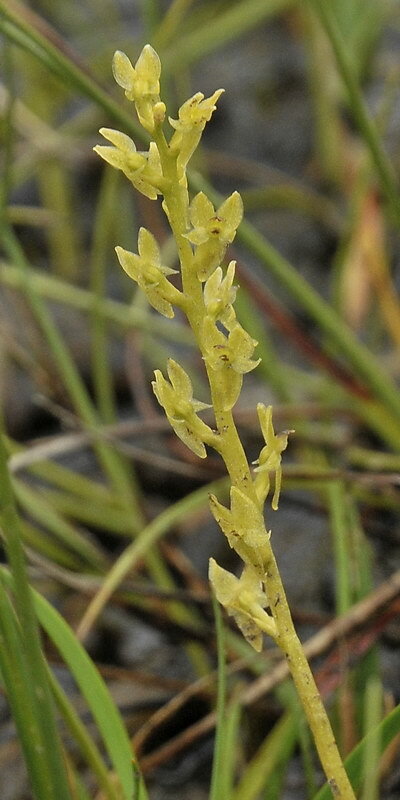 The striped upward pointing petal is the labellum, reversed to be on top in this species by a full 360° rotation of the flowering stalk as it matures. This twist can be seen in close up below right. Unlike Spiranthes romanzoffiana, this species seems well adapted to Irish conditions and very well suited to late Summer rains. It does produce seeds and also has a canny adaptation for reproducing itself vegetatively. This is the main reason why this species is closely associated with running water — they produce growths on the tops of the leaves which fall off and flow down a stream to settle in calmer water where they can immediately grow. These are not seeds; more like ‘cuttings’ from the parent plant. Shown here is a group of plants found much higher up the slope and close to the ‘Fern line’ that existed at the Dublin site where these photographs were taken. They were quite lanky and wispy, growing where bare earth was exposed as a stream emerged from heavier growth. Again only marginal presence of Sphagnum at this site which certainly made their discovery and recording much easier. Close up of a couple of flowers showing the 3 sepals (at back of flower), the two sideways pointing petals, and the modified central petal uppermost and pointing forward as seen on the right-hand flower. The straggly appearance of the cluster (on left) was markedly different from the straighter specimens encountered further down the stream. Could these be of seed origin? This habitat was a granite ridge running straight for c. 1km with steep slope (with bracken), then a largely grazed area with little Sphagnum apart from occasional deep and treacherous sphagnum filled ‘flushes’. 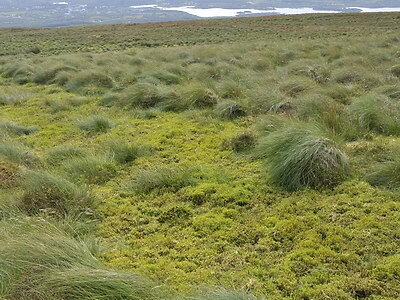 None were found either in these flushes or on similar Sphagnum areas explored recently on Slieve an Iarann. In the Dublin Mountains the Bog Orchid seemed to be actively exploiting bare streams where the water movement was preventing Sphagnum clogging up the water. Many occurred on tiny bends where micro-erosion was keeping the soil bare. So what is the possibility of finding this species in the Lough Allen area? a) They may well occur but it is also possible they don’t occur! In the Dublin Mountain site there is evidence that much distribution is on the basis of water borne ‘bulbils’ which form on the leaves, flow away, and then embed in ground further downstream. If there were no parent plants high up the mountain on Slieve an Iarann, then there would be no possibility of vegetative reproduction in this manner. b) Seeds are often produced in Ireland, according to the literature, so there is a source of seed which evidently renews the specimens in Dublin. Is this seed very local and is there a seed source in the Leitrim area. 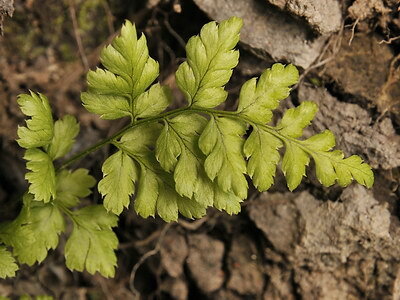 c) The geography of Leitrim seems suitable, with much of the occurrence of this species in Britain and Ireland being on the western seaboards and this plant dying out in midland areas of Ireland and Britain. It is an upland species and it does love roundly sloping hills. It is acid tolerant and thus suitable for the topography, geology and plant associations, typical of the Lough Allen area. d) It may well be the case that they DO occur but are so small and insignificant that it is like looking for a needle in a haystack. Certainly they have been sought and knowing their ideal facies (as seen in Dublin), we do know where to look. Below, is reproduced some images from Slieve an Iarann showing countryside and habitat that seems to meet their needs. None were found, but this area was moderately grazed. Footprints could be seen in most of the flushes we examined. We will continue this search — August is the best time for it. Taken from the western flanks of Slieve an Iarann these pictures look south west towards Drumshanbo and Lough Allen. 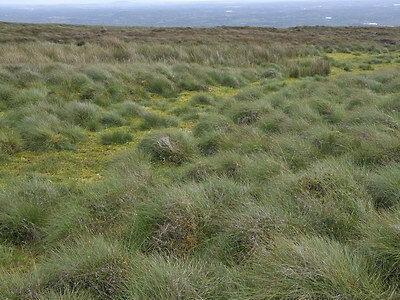 The habitat is gently sloping but, even though grazed, has a much greater cover of Heather, Grasses and Sphagnum than the area studied in Dublin. 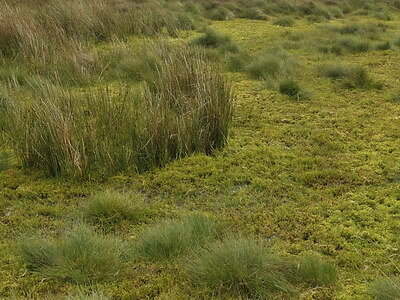 Two Sphagnum flushes can be seen in these photographs, one extending a considerable distance. From what we have seen of the Bog Orchid in Dublin, these sites look overgrown. On the LEFT is a closer view of one of the flushes. A small amount of free flowing water is visible in the foreground but with no rapidly flowing rivulet. Compared with the site in the Dublin mountains, it does not seem a suitable site for the Bog Orchid? More further work needs to be done on this area but it may not be ideal for Bog Orchids. We chose the site for its south west aspect, the same as in Dublin, but the soil was much more saturated and the vegetation (and geology) notably different. Both Slieve an Iarann and the Dublin site are actively grazed. Both are facing south west but, there, the similarity may end. The Dublin hillside, while still being a blanket bog, was firmer and more soiley than the Leitrim site. This probably reflects a slightly steeper and more variable slope at the Dublin site. All the little streams were open for much of their length only occasionally disappearing in a mass of rushes or entering flat Sphagnum ‘flushes’. In Leitrim the only open running water was either underground or in deep channels cut into the soft glacial covering of the lower slopes. These local differences had a considerable impact on the local flora and, by their associations, you can often recognise where a variety of rare plants can be expected to occur. Heather was much more widespread in Leitrim as were Rushes and Sphagnum filled streams. In the Dublin site Bog Asphodel was a common associate (seen as the upright orange blurs in photo on RIGHT). It was not seen at the Slieve an Iarann site! 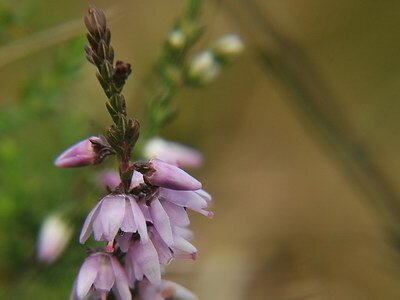 Dominant heathers seemed to vary too with the charming Ling still flowering on Slieve an Iarann (LEFT), whereas Cross-leaved Heather was the dominant species in Dublin. These factors, plus height (the Dublin site was much higher), combined with rainfall, presumably mean one area is ideal for the Bog Orchid whereas the other site is not? The slope was also more consistent in Leitrim leading to long strips of sodden ground. In Dublin there where areas of steeper slope with babbling exposed streams. Many specimens occurred where these fast clear streams reached flatter ground and the water slowed down. In fact they often occurred just above stagnant Sphagnum flushes. i.e the Orchids seems to favour a soil substrate to anchor into and also may be suffocated by areas over rich in Sphagnum? in deep gravelly channels or underground. Two Heather species in two slightly different habitats. The Bog Orchids occur in the site shown in photo on RIGHT? What could be the Differences? RIGHT Dublin. Bell Heather and Asphodel present. Slope variable with less Sphagnum and more exposed soil in stream beds. No large heather present. More rocks and changing slopes. Streams exposed and not overgrown for much of their length.